Homemade Fig Newtons – Have you ever looked at all of the ingredients in a package of store bought fig newtons? It’ll blow your mind! (#junkgalore) Stop buying, make your own. Trust me, homemade takes the cake every.single.time. Check out the original recipe link for a picture. I forgot to snap a picture of my own. Eggs, Avocados & Olive Oil Biscuits with Easy Oven Bacon – When my little one is asked about dinner, this is often her first request. She (and I) love eggs and avocados. Normally we put it on toast. This past week, we shook things up and went with Olive Oil Drop Biscuits. These biscuits ridiculously easy, fast, and delicious! 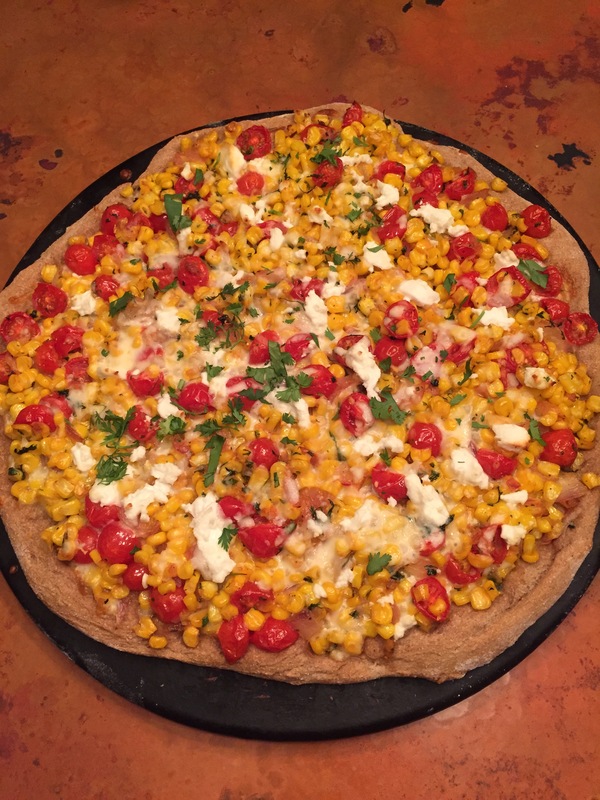 Corn and Tomato Pizza With Cilantro and Goat Cheese – Yes, you’ve seen this recipe here before…and you’ll see it again and again and again. It’s a family requested fave, and I’m happy to oblige. 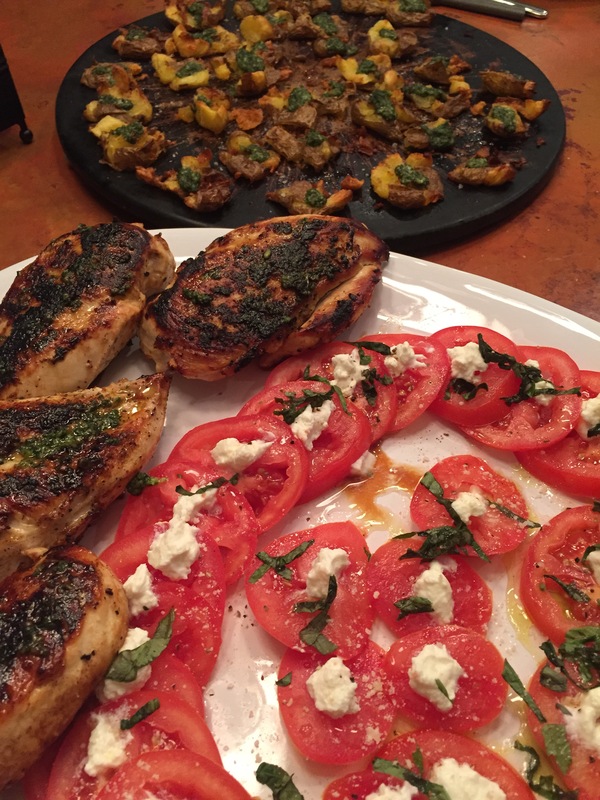 Ricotta, Basil, and Tomato Salad, Potatoes Gremolata, and Pan Seared Chicken – An impromptu dinner with old friends happened this weekend. Rather than go out, we opted to have them over and stay in. Sometimes, there’s nothing better than sitting around a table with great friends, reminiscing over great food and enjoying a great bottle of wine (or two). What I had in the fridge and pantry was a hodgepodge of veggies and some leftover herbs. However, when good quality cheese and olive oil are household stables, great things happen. Ricotta replaced mozzarella for a caprese-like salad that was ever so creamy. Basil gremolata with a hint of sea salt on roasted fingerling potatoes were a perfect combo of chewy with a slightly crunchy edge. All of this with pan seared chicken was definitely an easy and entertaining worthy meal. Smartphone users, scroll to the bottom of the screen to sign up for weekly recipe emails from We Eat For Real. Directions: In a small bowl, stir together the dry ingredients (flour, baking powder, cinnamon). In a larger bowl, whisk together the wet ingredients (eggs, coconut oil, maple syrup, vanilla, milk, applesauce). Add the dry ingredients to the wet. Stir until a dough form. Form the sticky, wet dough into a ball and cover with plastic wrap. Refrigerate for at least 1/2 hour (or freeze for 15 minutes if time is limited). While the dough is resting/cooling, prepare the fig filling (see recipe below). Directions: To a food processor, layer ingredients in this order: maple syrup, water, and then the figs. Pulse until a peanut butter consistency is achieved. Stop and redistribute ingredients in the food processor, if needed while pulsing. Preheat the dough to 350 degrees. Once the dough is cooled and ready to be rolled out, with flour dusted hands, turn the dough out onto a generously floured surface. Using a flour dusted rolling pin, roll out the dough (checking often that it is not sticking) into a rectangular shape between 1/4 and 1/8 inch thick. Spread the fig filling over 1/2 of the dough. Fold the uncovered portion of the dough on top of the fig filling covered portion. Use a pizza cutter to cut the dough into 2′ squares. Bake the squares on a silicone lined baking sheet or baking stone for 12 to 15 minutes, or until slightly golden. Enjoy! Start with an upside down biscuit (the flat surface is key). Next, comes a healthy slathering of avocado mixture. Finally, top with eggs, pressing the eggs into the avocado to help them “stick” to the biscuit. Finish with a dash or two of Tobasco style hot sauce, if you’re feeling daring. It really adds a great additional layer of flavor. Directions: Preheat the oven to required pizza dough temperature. In a medium/large skillet warmed to medium heat, add the olive oil and onion and jalapeno (if using). Sauté until onions are translucent (about 5-7 minutes). Add the corn and sauté another 5 minutes. The next step happens quickly because you do not want to burn the garlic! Add the garlic, stirring constantly, allow it to cook until for about a minute or until you can really smell it. Immediately squeeze the lemon over the skillet and add the cilantro. Stir in the cherry tomatoes and allow the heat to release their juices (about 5 minutes). Remove from the heat. With the dough on the pizza stone or baking sheet, add a thin layer of mozzarella cheese, followed by the corn mixture. Crumble the goat cheese atop the pizza and add the remaining mozzarella cheese. Bake according to your pizza crust directions. This is amazing – especially with a few drops of hot sauce on each slice!!! Directions: In a glass jar with a lid, add the dressing ingredients (olive oil, vinegar, salt and pepper) and shake vigorously. Set aside. Arrange the tomatoes in a circular platter on a serving dish. Dollop (is that a verb?) the ricotta evenly on the tomatoes. Next, sprinkle the basil and orange zest on the top. Drizzle the dressing over the salad. Refrigerate any dressing leftovers. Enjoy! Directions: In a food processor, combine salt, garlic, basil, lemon zest, and olive oil. Pulse until combined. Add mixture to a medium bowl and stir in the Parmesan cheese. Set aside. Boil potatoes in salted water until soft. Preheat oven to 400 degrees. Line a baking sheet with a single layer of the potatoes. Gently smash the potatoes with a meat tenderizer or bottom of a glass. Don’t be too rough. The desired outcome is an intact, but smashed potato. Drizzle with olive oil and sprinkle with sea salt. Place potatoes in the oven. [Begin pan searing chicken now]. Bake the potatoes for 15 minutes before carefully flipping them over with a spatula. Roast another 10-15 minutes. Remove the potatoes from the oven, and immediately spoon the gremolata mixture on the tops of the potatoes. Serve with pan seared organic chicken breasts. Kale & Eggs…Is that really good? Oatmeal Breakfast Cookies – Give serious consideration to doubling this recipe. You’ll be sad when these soft, cake-like cookies are gone. Basil Gremolata Potatoes and Tomatoes with Organic Greens Salad – This is how potatoes should be eaten! I’ve never seen potatoes get eaten so quickly. They are slightly crunchy at the edges, a little bit salty, and insanely good with the gremolata topping. Zucchini/Squash Lasagna – My little one is convinced she does not like zucchini/squash. She never suspected that the thinly sliced zucchini/squash were anything but pasta. She ate this like it was her job! This recipe is a great way to use up the squash/zucchini that seems never ending this time of year. Baked Zucchini with Goat Cheese – Thank you Mary Margaret (\We Eat For Real guest blogger) for sharing this recipe with me. The original recipe calls for cooked chicken. I did not have any when I made it. But, I did have my favorite pesto. So, I added a bit of it. I also had lots of cherry tomatoes. So, I threw in a few of those too. This is a perfect stand-alone meal, but it could easily serve as a side to chicken sausage, chicken, etc.